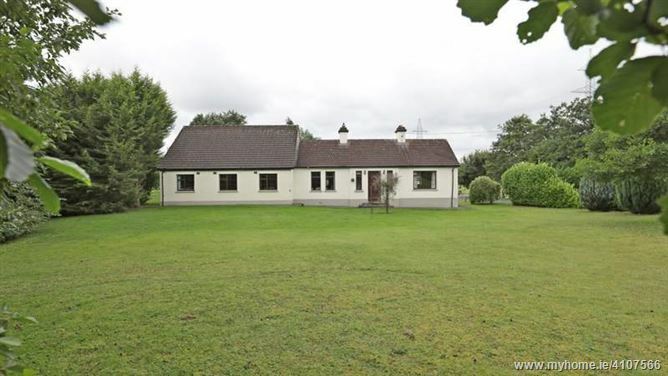 Maura Donohoe Auctioneers are delighted to present new to the market for sale an idyllic five bedroom bungalow with extension situated on c. 2 acre site of professionally landscaped gardens and out buildings. The property is approached by a tree lined avenue tarmac driveway with entrance gates. Accommodation briefly consists of entrance hall, sitting room, lounge, kitchen/breakfast area, formal dining room, five bedrooms with master en-suite and family bathroom. This residence boasts a prime location, peaceful and private yet within easy reach of all local amenities of the surrounding towns of Newbridge, Athgarvan and Kilcullen. This spacious family bungalow also enjoys stunning uninterrupted countryside views. Commuters have the benefit of the M7 and M9 Motorways 4 kms away with the train service from Newbridge/Kildare and bus route from Newbridge/Kildare/Kilcullen. Local sporting amenities include GAA, rugby, soccer, hockey, swimming, leisure centre, horse riding, canoeing, fishing and racing to name but a few. Wooden floor, alarm keypad, light fittings. Wooden floor, radiator covers, coving, wall lights, double aspect windows, light fitting. Solid wood floor, large cream enamel pot bellie stove, curtains, coving, open plan into kitchen, light fitting. Tiled floor, fitted units with tiled splash back, integrated oven, hob, extractor fan, dishwasher, fridge freezer, pedestrian door leading onto large patio area. Tiled floor, feature fire place with open fire and solid wood surround, curtains, blinds, light fitting, double patio doors leading onto large patio area. Solid wood floor, light fitting. Tiled floor, w.h.b., w.c., blinds, light fitting. Solid wood floor, curtains, light fitting. Fully tiled, large electric shower, w.h.b., w.c., vanity unit, light fitting. Wooden floor, double fitted wardrobes, curtains, light fitting. Tiled floor, curtains, light fitting. Solid wood floor, double fitted wardrobes, curtains, light fitting. Fully tiled, bath, w.h.b., w.c., light fitting. From Newbridge go through Athgarvan, at Kinneagh cross turn right and head for Kilcullen. After the motorway bridge property is on the right, note for sale sign.